I'm back from Wisconsin, the land of cold temperatures, after spending five days visiting five different game stores where I was fortunate enough to teach the Munchkin Collectible Card Game to dozens of gamers. The overarching response to the experience is summed up best as: Phenomenal! We knew the game was strong – both regarding the gameplay and the humor – but there's nothing quite as rewarding as going from store to store to store and watching Munchkin fans discover the strategies and silliness of the new game. The first stop was The GameBoard in Sheboygan, though it took many, many hours from when I left my hotel until the official event started. Amy, the manager of The GameBoard, picked me up at my hotel in the morning and then took me to meet the store's owner, Lynn, for lunch and an afternoon tour of the town. We had a great time chatting about games and the industry as they showed me around, and after a fantastic snack, it was time for the Munchkin Collectible Card Game event. We had a dozen pre-registered, and there were three or four others who sat in to demo the game, and the excitement ratcheted up time and again as the players caught on to the mechanics. The game's bluffing mechanic (see the rules at the official website) caught many off guard, but the players were soon tricking each other and cheating with the best of them. An incredible start to the tour! Following The GameBoard, I spent three hours at Board Game Barrister in Milwaukee. We had fewer players – nine this time around – but the response was just as strong. It was awesome watching as players learned the game, slowly transforming frustration – one player wasn't quite getting a handle on the strength of bluffing – into a wicked grin as the lightbulb went off and the mayhem escalated. The Drop Bear appeared many times at this event, as did the unassuming Blandy McBlanderson, and I think the event was a success since players were chatting with the store about when they could buy the game and boosters. Especially the boosters. Saturday morning, Amy picked me up and drove me to Green Bay where we stopped at two different Gnome Games locations and taught the Munchkin Collectible Card Game to over two dozen players. (Twelve at each store, of course, because I'm not quite good enough to handle the mob of players Randy saw at his GTS event.) You know the game is a hit when players are buying deck boxes and sleeves to protect their decks between rounds of play, and I heard more than a few players mention that they had already preordered full booster displays. Watching players crack packs at the Gnome Games stores drove home the fun of discovery; the alternate art and rare cards drew lots of appreciative oohs and ahhs, as did a few of the more dangerous Wizard cards that were pulled from the packs that we handed out as prizes. On Sunday, Amy and I were at Pegasus Games in Madison for the final store of the trip. Unfortunately, I needed about 30 minutes to recover from a slight illness, so Amy started things off. By the time I walked into the store, we had a dozen gamers all dropping bears and launching kabooms and gazebos at each other. 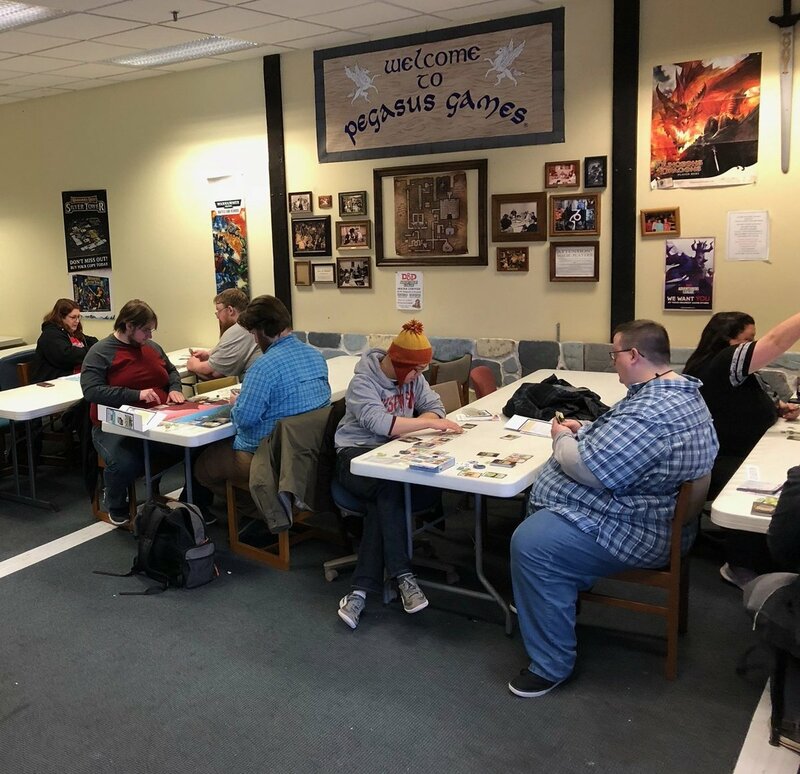 We spent about three hours at Pegasus, teaching the game, answering questions, and having a great time with the Pegasus staff who were friendly and helpful . . . we even got a chance to teach Super Kitty Bug Slap as the last two groups of players finished their final round. The bonus of the visit? Watching two players go wizard to wizard and seeing the murderous glee in their eyes as they uncovered the fun of the Forked Kaboom. Yes, combos are definitely a thing in the Munchkin Collectible Card Game. That was my final store of the trip. Five stores, hours upon hours of driving, and just about 60 Munchkin fans, each taking home a deck and all set to teach their friends the Munchkin Collectible Card Game when it reaches stores late in February. And this was only at the stores I visited! We'll have to ask Hunter and the others for their own reports if we want to hear how everyone's visit went. Thank you to the stores, the players, and to my wonderful assistant, Amy, for a great weekend in Wisconsin. I saw lots of awesome stores and players, though I think I would prefer visiting Wisconsin in May or June instead of January. I guess I'll have to go back later this year when the first Munchkin Collectible Card Game expansion reaches store shelves.